CityofAugustaSelectsSummitNaturalGasofMainetoservethecity - Summit Utilities Inc.
AUGUSTA, Maine — Summit Natural Gas of Maine announced today the City of Augusta has selected the company to provide natural gas service to all city buildings, including schools, a decision that will save the city $641,464 annually. The decision was made by a unanimous vote at the city council meeting on July 18. Summit Natural Gas of Maine will invest $63 million in infrastructure to provide natural gas service in the city of Augusta, for a total of more than 130 miles of pipeline, more than any other natural gas company in the area. As part of the contract to be executed with the city, Summit will serve 17 buildings that include City Center, Police Department, Lithgow Library, Buker Center, Flatiron, Airport Terminal, Airport SRE Building, several Public Works buildings, Hartford Fire Station, DP Wells Fire Station, Western Avenue Fire Station, Hospital Street Fire Station and the Augusta Civic Center. The contract will also include service for six schools in Augusta; Cony High School, CATC Tech Center, Farrington School, Gilbert School, Hussey School and Lincoln School. The proposal from Summit Natural Gas of Maine also includes a commitment to serve Gardiner and Hallowell with service available in some areas as early as this fall. Summit Natural Gas of Maine’s construction on the natural gas pipeline is well underway as three construction firms are building-out the first phase of the company’s planned $350 million Kennebec Valley natural gas transmission and distribution project. 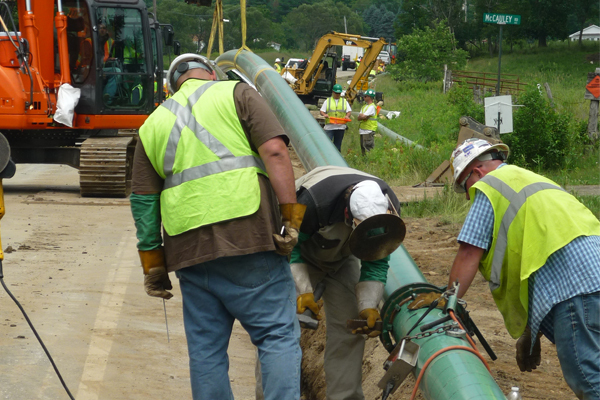 Construction crews totaling more than 430 workers are currently working in Augusta and from Pittston to Madison on the installation of 68 miles of steel pipe and 66 miles of plastic distribution pipe in various communities throughout the region. To learn more about service areas and the construction project, call 855-353-4433 or visit www.summitnaturalgasmaine.com. Summit Utilities, Inc., the parent company of Summit Natural Gas of Maine, operates 20 natural gas districts throughout Colorado and Missouri, and specializes in providing natural gas to areas that are either hard to serve or that aren’t being served. These districts represent approximately 36,000 customers, $260 million dollars in assets, 400 miles of high-pressure steel main lines and approximately 1,500 miles of polyethylene gas main lines.